A cleverly simple book builds skills as well as towers. 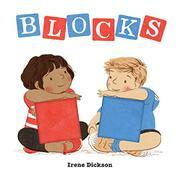 Ruby, a dark-skinned, dark-haired child wearing red, has red blocks, while Benji, a white boy clad in blue, has blue. Once introduced in bold mixed-media illustrations set against empty white backgrounds, they engage in parallel play and build separate towers with their respective blocks. Ruby is on the verso and Benji on the recto, with the gutter neatly separating them—except for an errant red block that barely sneaks onto Benji’s side. With the next page turn, Benji takes a red block, and Ruby looks on, aghast. After she watches him walk away, the next double-page spread shows the children in a furious tug of war across the gutter that sets them up for the next chaotic spread. They’ve now pulled apart and tumble onto opposite pages amid a storm of blue and red blocks. Once they gather themselves they notice they both have blocks of each color, and they build a big blue and red structure together. That could be a fine end to the picture book, but Dickson has more in store: a page turn shows Guy, a young black boy clad in green, pulling a wagon with green blocks. “What will they do now?” asks the final line of text, leaving possible answers open for readers to speculate on.